We have been waiting for this holidays for a while. As every year you longing for a holiday after some busy days of work and study. Our plan was to leave at the first Xmas evening, after our dinner with the parents. Unfortunately some plans don't go the way you want them to go. As we had a burial ceremony of our grandma, we had to leave 2 days later. So that was Saturday, 27 of December in the lunch time. We arrived at the destination place at 21:00. Fortunately we didn't have any traffic and arrived even faster than we thought. Gabi and her husband were waiting for us. We got the keys en they showed us around. We were stunt when we saw the rooms. Everything was perfect, better then we expected. When I woke up in the morning and went to the living room, I was amazed by the beauty of the Alps and the hills and the lakes nearby. We went the same day for a short walk around the lake. It was very good weather, full sun actually. We have made lots of nice photo's. The next day was the shopping day. We have made some shopping, Gluhwein of course and sausages :) After shopping we did some sightseeing around the place where we lived. We visited the area of the Neu Schwanstein castle, which was build by Ludwig the 2d, but was never completely finished because the king unexpectedly died. Ludwig the 2d build actually 2 more castles. He spent all the private money he had and even made some debts, which his family after his death had to pay. They did it by making from the castles the museums, in that way they got enough money to pay off the debts. That was a short note about Ludwig the 2nd. In the evening we did some reading and went in time to bed. Because the following day we planned a bigger walking trail. 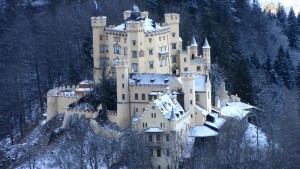 On Tuesday, 30 December, we visited Neu Schwanstein castle. It's very spacious and impressive castle. We had to park the car down the hill and we decided to take a horse ride to the castle. It was cool! After the excursion through the castle we went back to the car, eat lunch, took rucksack and our walking sticks. The walking trail began at 13:00. That was pretty heavy trail. We climbed almost 1km up the mountain. Narrow walking trails, sometimes covered with snow made it extra difficult. But the view on the mountains, the fields, the lakes and the castles made up for our heavy trail. The surrounding was indescribably marvelous. We were at the hight of almost 2000m. So you can imagine how far you can look from that hight. The last part of the walking trail was very difficult, quite a bit of snow, old lavines and climbing up the mountain was not that easy. But we reached the ski lift in time and were safe down the mountain. We had to wait for a bus so we went to have some Gluhwein at the cafe. The next day, Wednesday 31, we expected some muscle aches. But we were fit and didn't have any changes in our bodies. So we decided to have another walk. This time trough the Feuer Stein schlugt, so called Firestone canyon. It took a while to find out where he was. We were sitting on the bench and looking at the map for it. As it later turned out, the Firestone canyon was behind our back!!! We had a good trip, have seen some nice ice-sculptures and beautiful landscapes while we were climbing up the hill. On Friday, 2 January, we visited Linderhof castle and a cluster Wieskirche. The castle was very beautiful, that was Ludwig's villa. He spent there more time then in Neu Schwanstein castle. In the evening we went to eat out, some Bavarian food. And it was without doubt very delicious. At home we read for a bit and went to bed. Saturday, 3 January we packed our bags, said goodbye to Gabi and Werner, to our neighbors, did some shopping and left heading for Holland. We hope you enjoyed our story.